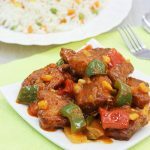 Chilli fish recipe or fish manchurian recipe with step by step pictures. Indian chinese recipes are very popular in Indian restaurants. 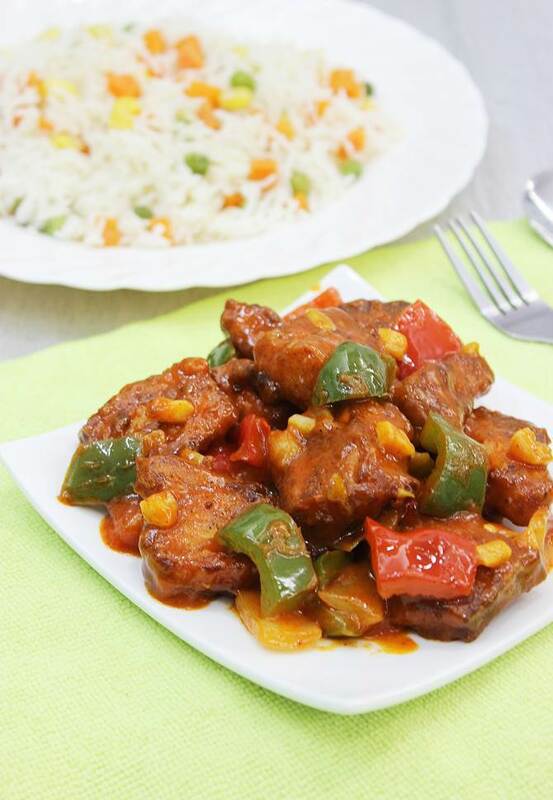 Some of the most popular are the Chilli chicken, chinese fried rice, hakka noodles and the manchurian dishes. These dishes taste sweet, sour and slightly hot. Chilli fish and fish manchurian are same in few restaurants, but in some restaurants fish manchurian is made with fish balls. But the sauce remains the same. 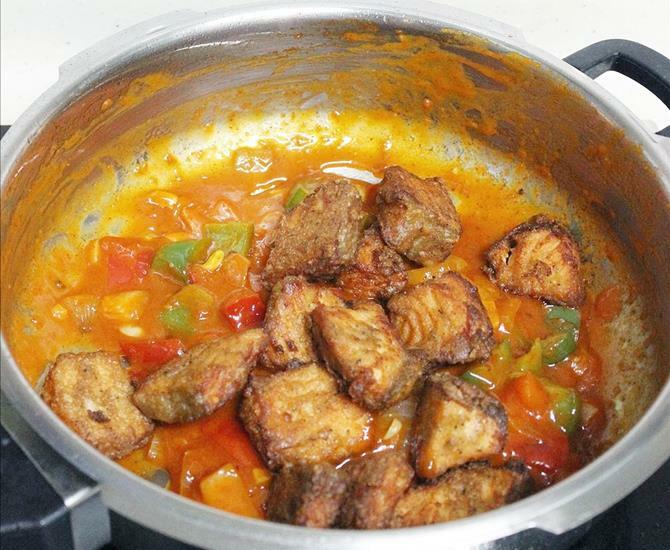 If you are looking for a salmon fish recipe that does not need sauces, do check the Apollo fish recipe here. 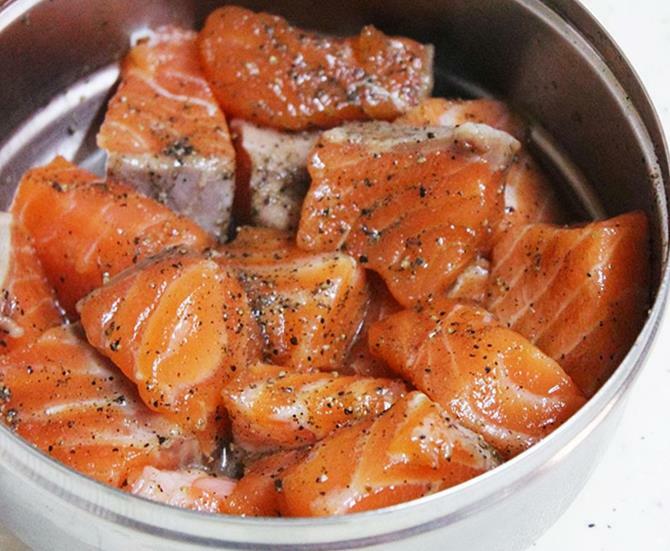 If you are interested in a baked salmon recipe, check here. Spring onions are very important in any Indo chinese recipes but I did not use them since I had no stock of it at home. So I used a white onion.I have not used ginger garlic paste for the marination, if you like you can use. Bell peppers are optional. Add Soya sauce, ginger garlic paste, and pepper powder. Mix and marinate. Set aside for at least 30 mins. Add the sauces to a bowl and set aside. Heat a pan with oil for deep or shallow frying or preheat the oven and bake. 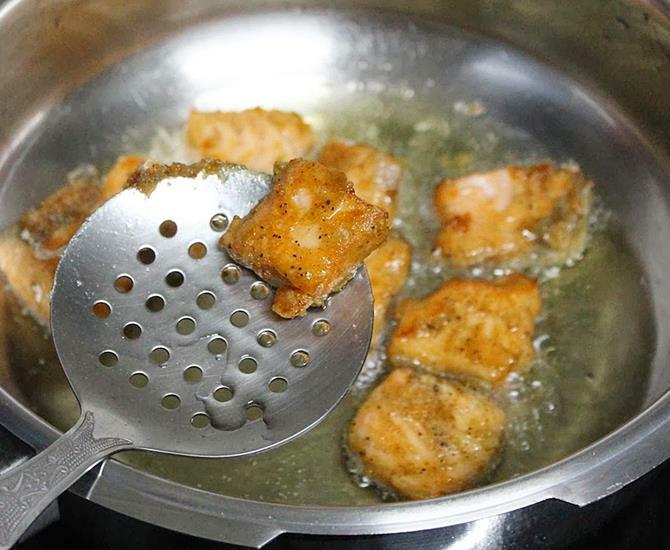 Fry the fish pieces to golden on a medium flame. Drain these on absorbent tissue. Add garlic and fry till it gets fragrant. 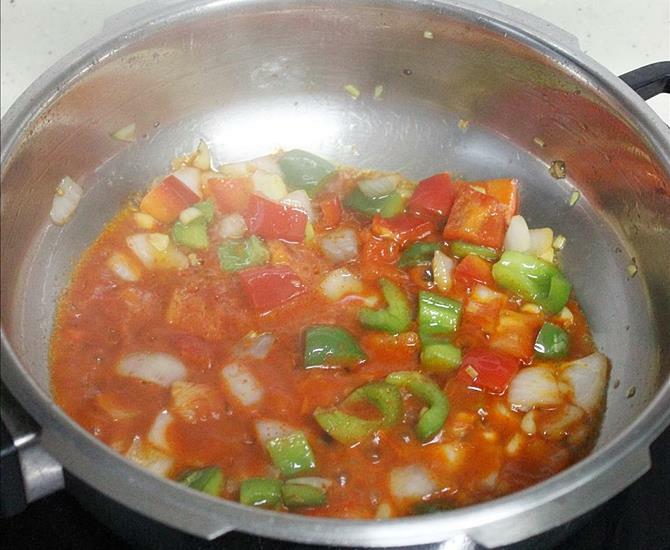 Add capsicum, layered onions (white parts of spring onions) and fry on high flame for about 3 mins. Onions and capsicums should be crunchy (not over cooked) and not soft. Stir the sauce mix. When it bubbles, add fish. To make a gravy version, pour the corn flour mixture first. Allow it to thicken on a low flame, it gets done quickly. Then add the fish. If you are using salmon to prepare this dish, you need not use egg since this fish remains moist and soft after frying too. But if you are using any other kind, you could use 1 small egg to lock the juices in the fish so that they remain soft, juicy and moist after frying. 1. Wash and cut the fish to cube sized pieces. 2. Add ginger garlic, soya sauce and pepper powder. 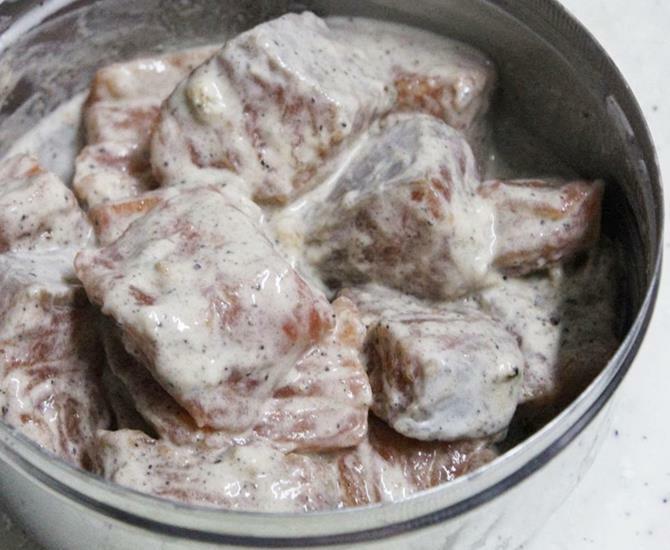 Marinate and Set aside for at least 15 mins. 3. Stir to a bowl 1 tsp vinegar, 1 tsp soya sauce and 2 tsp red chili sauce. Set this aside. Add more or less sauce as needed. To get a nice red color you can also add little red chili paste. I mix little red chili powder with very little water and then use it. 4. Heat oil in a pan for deep or shallow frying or can even bake these. 5. Add 1 ½ tbsps. Corn flour and 1 ½ tbsps. Plain flour little salt and mix well. 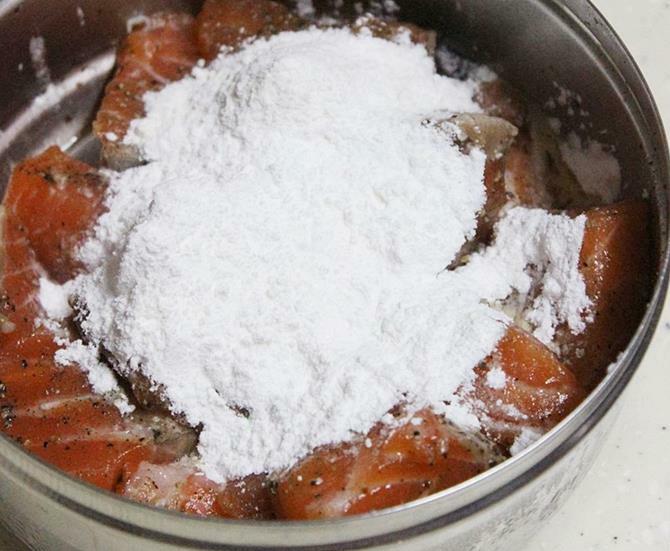 Sprinkle very little water and mix well to coat the fish with flour. Do not make it runny. Refer the pic. Fish must be coated with a thin layer of batter. 6. When the oil is smoky hot, reduce the flame slightly and then fry these pieces to golden. Drain these on kitchen tissue. 8. Add garlic and fry till you get an aroma. Add capsicum, layered onions (white parts of spring onions) and fry on high for 3 mins. 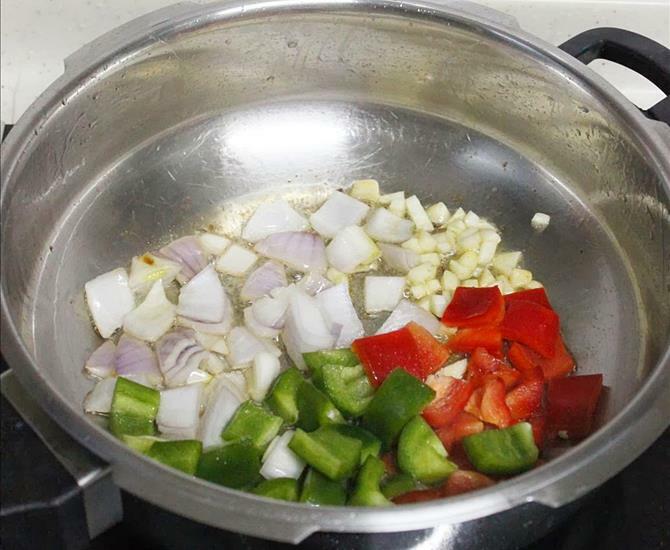 Onions and capsicums must be crunchy (partially cooked) and not soft. 9. Stir the prepared sauce mix from step 3 with a spoon for uniform mixing. Pour this to the pan. Allow the sauces to bubble. Can we bake this like as done for the chicken chilly? This recipe is always a hit with my family and friends. Everyone praises me whenever I make this. Thanks a ton dear for this yummy dish. It’s so easy to prepare and delicious to eat. is there a way to enter in a search field for a specific recipe? So glad to know you made it good and got appreciations. Mouthwatering. <br />Thanks for sharing.